The Schoeps ORTF Surround Outdoor Set is a quartet of Schoeps condenser microphones with a heated windscreen system designed for ORTF surround recording of instruments and ambience indoors or outdoors in windy conditions. It delivers accurate 360° imaging and spatialization along with enhanced channel separation. It includes four CCM 41 Lg supercardioid mics, a heated basket-type windscreen system with a fur cover, an ORTF surround mic mounting bar, a multi-pin extension cable, and a break-out cable that converts the multi-pin extension to four XLR 3-pin jacks. The microphones boast wide frequency responses, excellent off-axis rejection, and compact bodies. The included windshield is acoustically transparent and offers significant vibration isolation and wind-noise reduction. Its internal heating system prevents frigid temperatures from impacting microphone performance. An integrated cable system merges the individual mic outputs to a multi-pin jack. Connect the multi-pin output to the supplied extension and breakout cable, which converts the multi-pin plug to four standard XLR 3-pin connectors. From there, you can easily route signal to your preferred mic preamps. The Schoeps CCM41 LG is a miniature supercardioid microphone with detachable cable. The design is a direct result of the demand for a compact capsule with the pick up of a shotgun microphone. Off-axis sound is attenuated more effectively than that of a traditional cardioid polar pattern, and its frequency response is well suited for natural reproduction of vocals and instruments. The CCM 41 has slightly more roll-off at the low end due to the gradient effect, and is well suited as a "spot" microphone for orchestras, choirs, ambiance and more. The WSC ORTF Surround Basket-Type Windscreen with Fur Overcoat from Schoeps covers the entire ORTF Surround arrangement (not included). The basket-type windscreen comes with an elastic suspension and fur-like overcoat. The entire ORTF Surround arrangement can be conveniently mounted in the single elastic suspension, and share a single windscreen. The AK SURROUND M/4U Miniature Multi-Pin to XLR-3 Adapter Cable from Schoeps is well suited for ORTF Surround recordings. This adapter cable splits the K Surround x 5M cable with multi-pin connectors to four XLR-3 connectors. 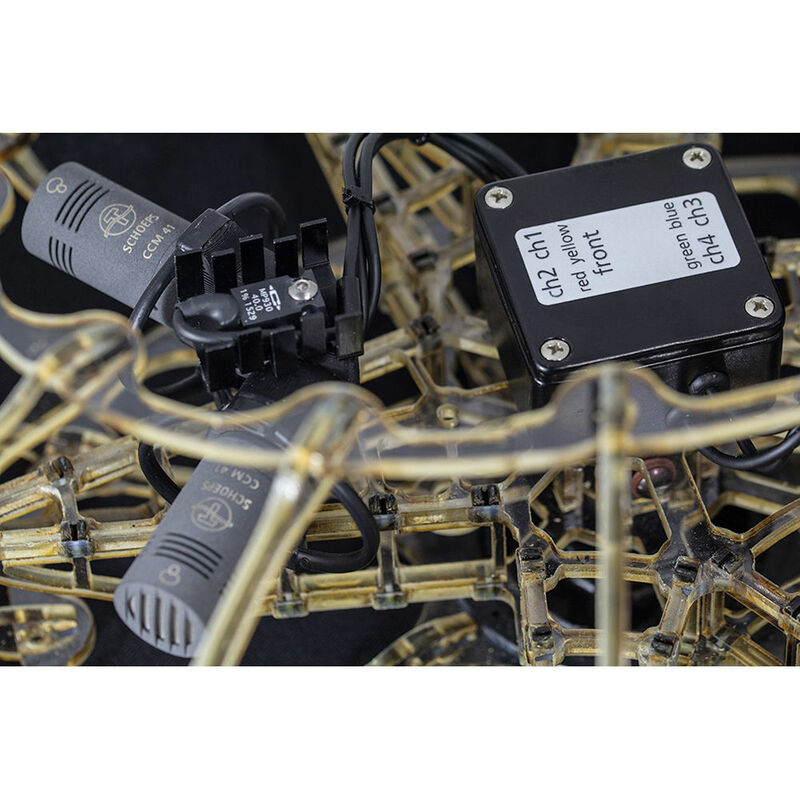 The Schoeps K Surround 20 is designed to connect the company's ORTF Surround Bar LM to the company's AK Surround M/4U breakout cable (4x XLR 3-pin male). The ORTF surround recording method is designed to pick up surround ambience. The microphone arrangement and its sonic characteristics are similar to those of the IRT cross method, with both the 360° imaging and the spatial impression optimized.